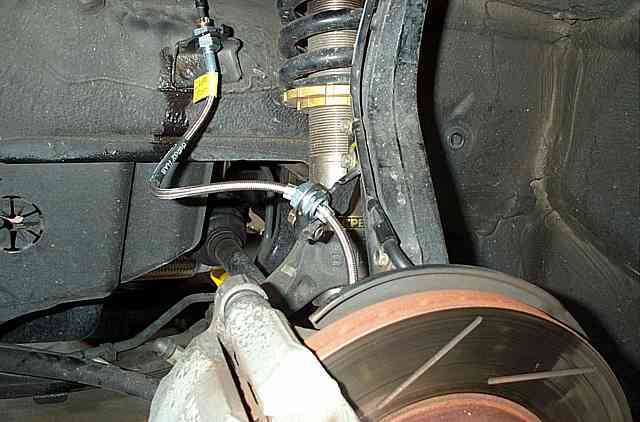 *Most people call them brake lines, but manufacturers refer to them as brake hoses. So what's the concept of stainless steel braided brake hoses? When your car is in a situation where constant or repeated hard braking is performed, your brake fluid starts heating up considerably. 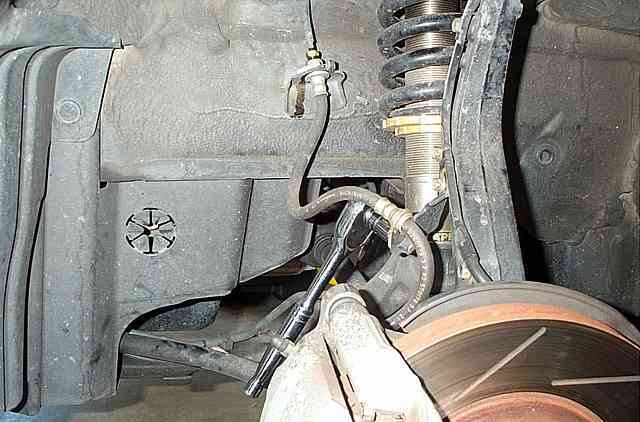 At that point, your factory rubber brake hoses soften up and expand when the brakes are applied. When your brake hoses expand, the full pressure is not being sent to the brake calipers to do their job at max potential. The stainless brake hoses resist expansion and allow full pressure to be applied to the calipers. **When upgrading to stainless steel brake hoses, you should also upgrade your brake fluid to high performance DOT4 brake fluid (DO NOT USE DOT5!). Make sure to look for synthetic (although most DOT4 are). ***When working on the brake hoses, it's recommended that you use latex or nirtle gloves. Brake fluid and skin doesn't mix well. Tools/supplies needed: Ratchet set, torque wrench, flare nut wrench set, adjustable wrench, locking pliers, rags, brake cleaner, open ended wrench set. Parts needed: New crush washers for brake hoses (should be supplied with new brake hoses). Check the -BRAKEBLEED- page for additional supplies needed. Step1: Raise the car on jackstands. 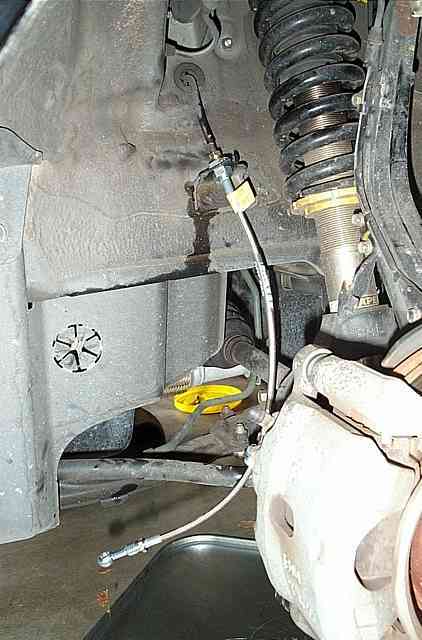 Place the wheels in between the jackstands for additional safety. Step2: Open the brake fluid resovoir. Using a pump or turkey baster, remove as much fluid as possible. Step3: Place a catch pan or several newspapers under the area you'll be working on. 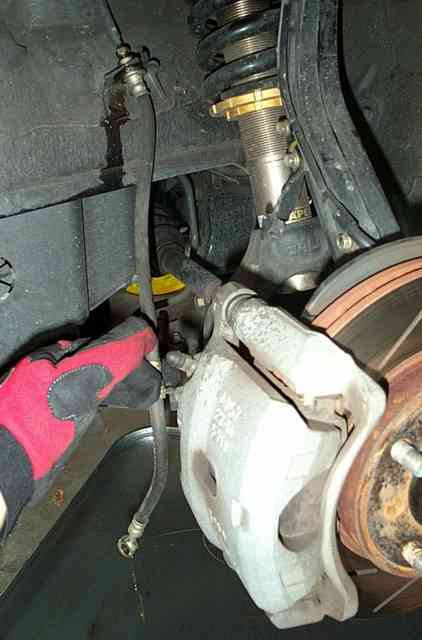 When you remove the brake line, a good amount of brake fluid will be draining out. 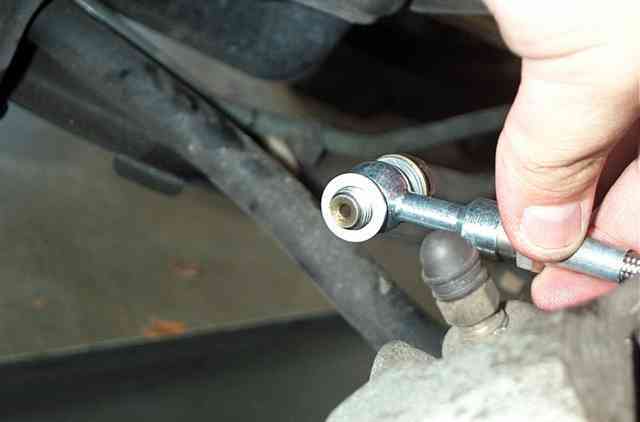 Step4: Using the 10mm flarenut wrench, loosen the top nut of the brake hose. If you don't have a flarenut wrench, you can use locking pliers as a substitute. Make sure it's locked tight so you don't strip the nut. Step5: Loosen the bolt securing the hose to the bracket. Step6: Loosen and remove the banjo bolt securing the hose to the brake caliper. Step7:Using a big flat head screw driver, pry out the metal clip holding the hose against the main brake line. Remove all the previous bolts/nuts to take the complete hose off. Step8: Reverse process to install the new hose. Tighten the top nut first Decently tight, Torque spec: 11 ft. lbs.). Depending on which brand you get, some will reuse the clip for securing, and others might use a nut instead. If it came with a nut to secure it, make sure to put the nut between the main line and bracket before you guide the brake hose through the bracket and into the main line. Step9: Run the hose to the bracket and caliper. Hand tighten everything at first. 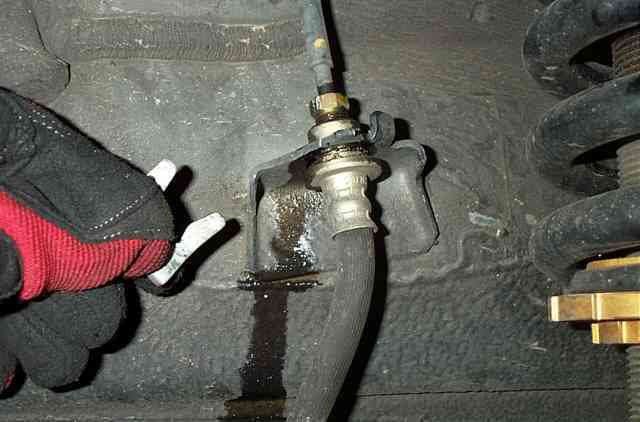 This way you can check to make sure the hose is run correctly from the main line to the caliper. You don't want the hose to be binding. Step11: Same procedure as the front. 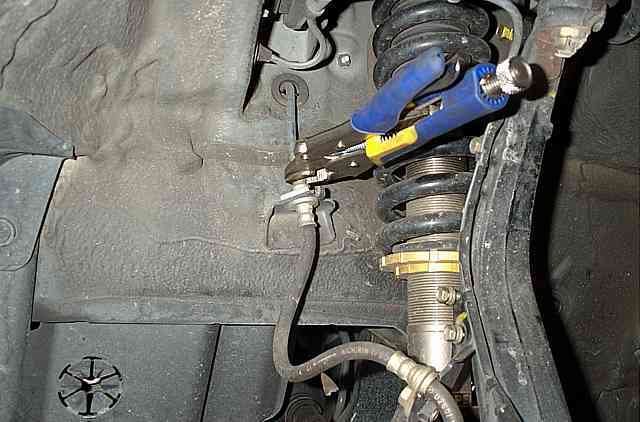 Step12: Once you've finished installing all the new hoses, Wipe off any brake fluid that got onto your car, suspension parts, etc. It's very corrosive. Next, it's time to fill the fluid resovoir and bleed the brakes. 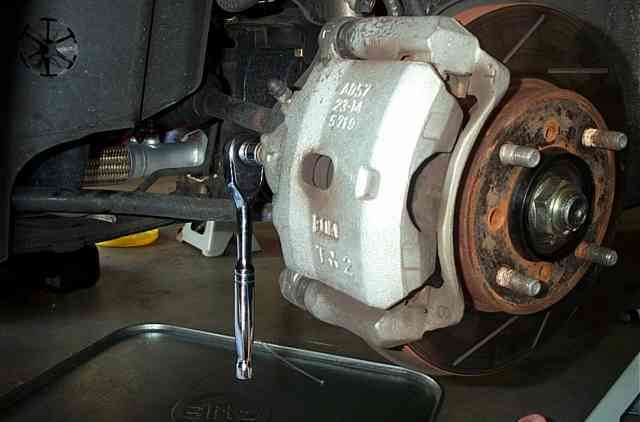 Step13: After a day or two, rebleed the brakes.